This Winter I’ve spent most of my time riding indoors on a turbo trainer, safe from the dangers of ice, snow, wind and bad driving. I have a good setup but generally need group rides and some uptempo music to keep me entertained as I literally stare at the walls. Every now and again one of the perks of Zwift is that you get the chance to ride with a pro rider who could be your hero. Jens Voigt is possibly the most popular 00s non-contender cyclist. His 17 consecutive Tour de Frances between 1998 and 2014 made him a well known name for all cycling fans, especially for his two breakaway stage wins. Jens Voigt took the chance to lead a group ride on Zwift this week. The ride with Jens Voigt took place very late one night (00:30am) as it came live from the Tour Down Under which started yesterday in Australia. Luckily this ride was on a Friday night so I knew I would be able to have a lie-in the next day! We rode for 60 minutes around the London Classique course which was used for the Women’s Worldtour race in 2016. It’s a fairly flat and easy course at 5.5km long, but it takes in all the sights of central London which even look good virtually. Riders are taken past the Houses of Parliament, Big Ben and Trafalgar Square before heading down the Mall to Buckingham Palace – I think even the London Eye sneaks in an appearance. As we cycled along at a quick tempo for mere mortals, riders were able to pose questions to Jens Voigt and have him answer to the group. Many questions were asked and answered, most fairly sensible ones too surprisingly – no-one took the chance to ask him his favourite film or beer for instance. Given the proximity to the Tour Down Under which has now started (albeit with a truncated stage due to heat), he reckoned that Richie Porte had the best chance of winning it. Whilst on the topic of pro-cycling, Jens was asked quite a few questions about his time in the peloton. The best room-mate he had was ‘funny guy’ Bobby Julich, who he rode with in 2000-01 with Credit Agricole and also later at Team CSC between 2004-08. The best leader he rode for as a domestique was Andy Schleck, described as ‘classy’ – the two won the 2010 Tour de France together. Lance Armstrong naturally came up, Jens says that he always got on with his 2011 team-mate, chatting about family and kids over coffees. Surprisingly despite the red rag to a bull effect that the Armstrong name has, something sensible followed it up. Whilst riding as a pro, Jens would clock up an average of 35,000km during the year with around half of that taking place at races – I thought I’d done well to manage 13,000km last year! 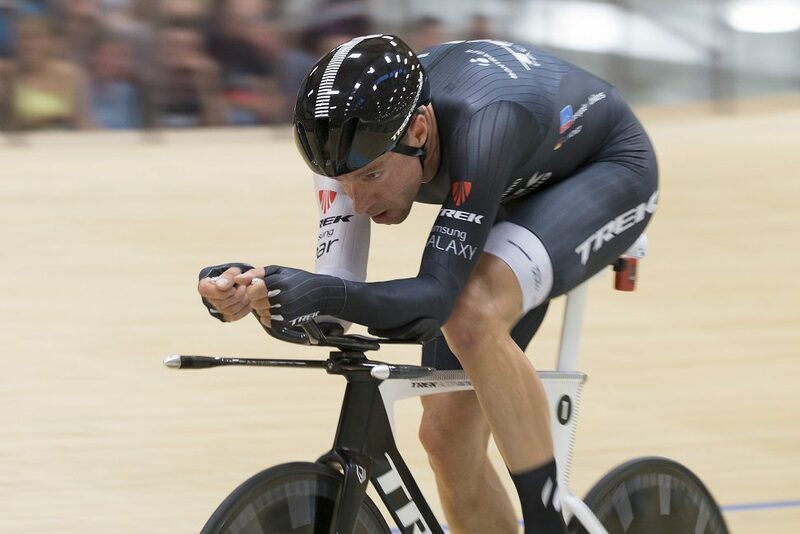 Once the rules for the Hour Record were changed, Jens Voigt was one of the first riders to take to the velodrome to try and beat the existing record. Jens briefly held the record for 6 weeks before Matthias Brandle set a new record. For the Hour Record Jens was weighing 78kg (I can only dream to be such a weight!) and averaged 413 watts (I can only dream to hold such wattage for an hour!). It’s unusual to get the actual numbers, but it shows the difference between the average club cyclist and a pro. My best power to weight ratio I’ve recorded is 3.6w/kg whereas Jens held 5.3w/kg – a huge amount of daylight! We also learn that his eldest son plays lacrosse and his second son raced bikes for 5 years but stopped. Clearly there won’t be any new Voigts gracing the pro peloton in future years. Finally, Jens’ worst bonk (where you run out of all energy and can barely turn the pedals) was in a junior stage race, whilst in the lead and once the bonk happened he lost the race by a big margin. It’s always worth keeping an eye out for Zwift events with former and current Pros, you never know what tidbit you might learn!